FREE Email or US Postal 1st Class Mail Delivery! Please place a separate order for Gift Certificates to be able to set up the correct shipping method. Don't let Defender's selection of over 30,000 items overwhelm you. 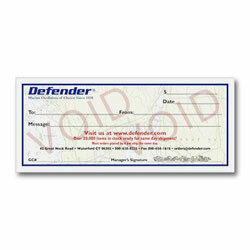 A Defender Gift Certificate is the Perfect Gift for the boater on your list. Choose from a number of denominations from $25.00, up to $1000.00. Your favorite boater can spend them just like cash on exactly the things they are looking for! Defender Gift Certificates can easily be used Online in your Defender.com shopping cart, for Phone Orders at 1-800-628-8225 or in our Warehouse Outlet Store in Waterford, Ct.
Buy with confidence that you can't get the wrong color. Everyone likes this shade of Green!